22.1.1900: Launched by Miss G. Moody at Earle’s Shipbuilding & Engineering Co Ltd, Hull (Yd.No.468) for The Fleetwood Steam Fishing Co Ltd (64/64), Fleetwood (Shareholders: J. Heap, Blackpool; H. Heap, Blackpool; H. Kelly, Grimsby; G. E. J. Moody, Grimsby; G. Selijoth, Fleetwood, W. C. Frith, Fleetwood and T. Lockwood, Poulton-le-Fylde) as CONNIE. 24.2.1900: Registered at Fleetwood (FD194). 6.3.1900: George Edward James Moody, Grimsby designated manager. 27.5.1900: Put into Belfast with leaky boiler. 10.1900: Fishing in the Minch off Bayble, An Rubhain (Sk Robert Wright), arrested by Scottish Fishery Board’s cruiser VIGILANT, for alleged illegal trawling. 5.10.1900: At Stonoway Sheriff Court, Sk. Wright pleaded guilty and fined £100 or 60 days imprisonment, with confiscation of the net. 2.9.1908: At Killala Petty Sessions, Co. Mayo, skipper convicted of illegal fishing off the coast of Co. Mayo and fined £50. 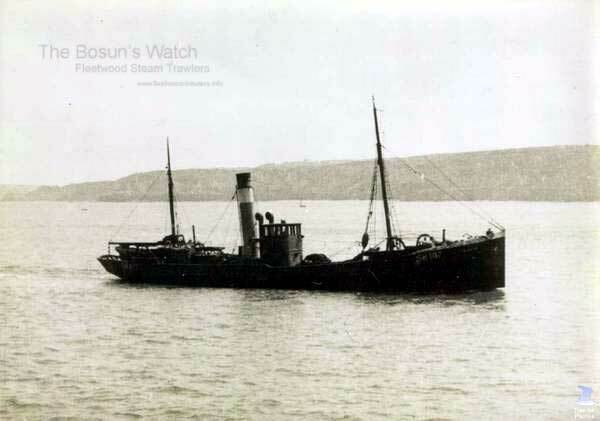 26.1903: Arrived Fleetwood under tow after supposedly damaged her stern post on sunken rocks off Tiree, Inner Hebrides. 2.12.1907: Stranded on Tory Island setting up stem by 18”. 28.10.1908: At Fleetwood Magistrates Court, Percy Lloyd was charged with stealing a gold Albert, value £7 10s. Sk.Herbert Nightingale said prisoner was discharged from the trawler on Monday and was paid up, including “liver” money. On Tuesday witness and prisoner met and there was some dispute about payment. They went to Mr. Frith, manager for Messrs. Moody’s and Kelly, and he after hearing both sides, it was decided that 2s 11d. was due to Lloyd. The skipper declined to pay and Lloyd shouted, “I will have my whack,’’ and snatched the skipper’s watch chain and ran off. Later in the day Lloyd was arrested and claimed that he had thrown the chain down a drain grating in Lower Dock Street; the grating was removed as well others, but no trace of the chain could be found. The magistrates, expressing disbelief in his statement, sentenced Lloyd to a months hard labour. 7.1911: Fishing in Firth of Clyde (Sk. 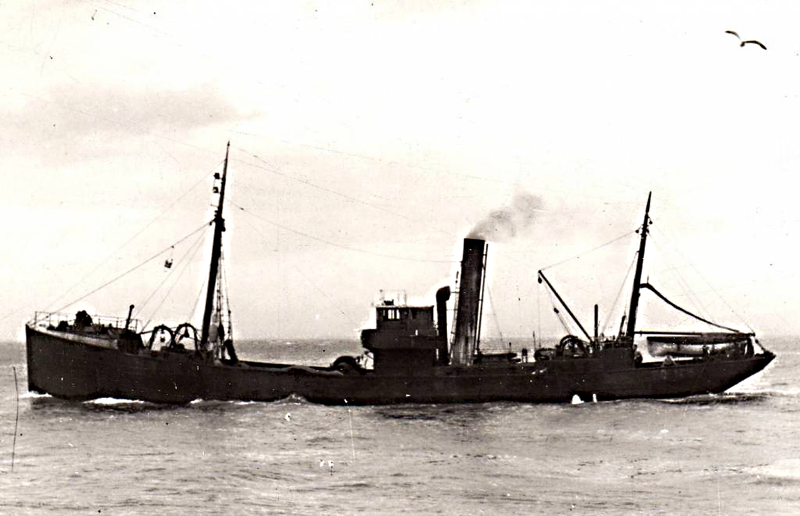 Charles Hickford) in company with steam trawler CORONET (GY) (Sk. Richard Wright). Arrested by Scottish Fishery Board’s cruiser VIGILANT, for alleged illegal trawling. 22.7.1911: At Campbeltown Sheriff Court, both skippers fined £50 and nets confiscated. Both men had pleaded that in fog they had mistaken their position but commander of VIGILANT stated that there was no fog at the time of the incident. 14.02.1912: At Malin Petty Sessions Court, Co. Donegal, Sk. Charles Hickford, was prosecuted by the Department of Agriculture and Technical Instruction for Ireland for illegal fishing off the coast of County Donegal. The magistrates imposed a fine of £50, with £6. 6s. costs. 1.1.1914: Tonnage altered to 77.93 net under provision of Merchant Shipping Act 1907. 5.4.1915: At Fleetwood Magistrates Court, James Neil, Belfast was charged with stealing ship’s stores valued at 35s, the property of Messrs. Moody’s and Kelly. Police Superintendent Thompson said that Neil was employed as cook and on returning to Belfast on Friday 1st the groceries were discovered in his bag. The accused pleaded guilty and after hearing evidence from PCs Butcher and Ashcroft and in view of his good record supported by ship’s husband John Darnell, he was fined £5. 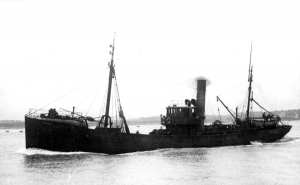 6.1915: Requisitioned for war service as a boom defence trawler (Ad.No.NI). Based Cromarty. 26.7.1927: At Bangor Magistrates Court, Carnarvonshire, Sk. George Hunt fined £20 plus costs for trawling within the three mile limit and retaining immature fish. 24.12.1927: Sold to The Filey United Steam Trawling Co Ltd, Scarborough. Richard Ferguson Scotter, Filey designated manager. 1.1928: Registered at Scarborough (SH107). 1929: Sold to Connie Steam Trawling Co Ltd, Filey. Richard Cammish, Filey, designated manager). 1942: Sold to Boston Deep Sea Fishing & Ice Co Ltd (64/64), Fleetwood. Basil Arthur Parkes, Cleveleys designated manager. Landing at Fleetwood from Home and Faroe grounds. 24.5.1943: Typical landing. Faroes – 230 kits, cod/codling-131, haddock-29, whiting-14, plaice-5, ling/coley-51. 1945: Sold to Humber Trawlers Ltd (64/64), Grimsby. 23.3.1945: Vessel mortgaged (64/64) to National Provincial Bank Ltd, London (A). 28.3.1945: Registered at Grimsby (GY31). 28.3.1945: Joseph Reynolds Cobley designated manager. 1951: Sold for breaking up. 16/12/2012: Page published. 6 updates since then. 05/05/2017: Removed FMHT watermark and added an image. This entry was posted in Steam Trawlers, Steamers (Picture) and tagged Boston DSF & I, Fleetwood SFC, Parkes on May 16, 2012 by Fred Smith. Ordered by Great Grimsby & East Coast Steam Fishing Co Ltd, Grimsby as the CORINTHIA purchased by The Admiralty on the stocks. 30.1.1917: Launched by Cook, Welton & Gemmell Ltd, Beverley (Yd.No.357) (non standard “Mersey” class) for The Admiralty as JOHN APPLEBY (Ad.No.3612). 25.5.1917: Completed (1 – 12pdr, Hydro and W/T). 1919: Registered by The Admiralty in the Registry of British Ships at London. 3.2.1920: Registered by The Admiralty as a fishing vessel at London (LO286). 1.1923: Sold to Fleetwood Steam Fishing Co Ltd, Fleetwood (George E. J. Moody, Grimsby, manager). Fishing from Fleetwood. 19.1.1923: Registered at Fleetwood (FD424). 1938: Will B. Moody, Grimsby appointed manager. William Moody Kelly, Fleetwood, managing agent. 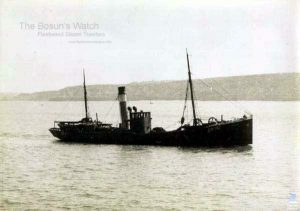 20.11.1939: Off Tory Island, Co. Donegal picked up crew of SEA SWEEPER (FD171) stopped by U-boat (U.33) and sunk by gunfire. 27.2.1940: Requisitioned for war service as a minesweeper (P.No. FY.781) (Hire rate £83.8.4d/month). 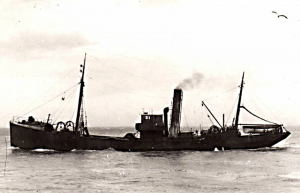 30.12.1946: Sailed Fleetwood for Icelandic grounds (Sk. George Smith); fifteen crew. 5.1.1947: Wrecked at Grindavik, south west coast of Iceland in severe weather. Crew* rescued by breeches buoy but skipper lost. 21.1.1947: Fleetwood registry closed “Total Loss”. 22/01/2009: Page published. 3 updates since then. This entry was posted in Lost Vessels, Steam Trawlers, Steamers (Picture) and tagged Fleetwood SFC, Lost, Mersey Class on January 22, 2009 by Fred Smith. 10.9.1907: Launched by Earle’s Shipbuilding & Engineering Co Ltd, Hull (Yd.No.537) for Fleetwood Steam Fishing Co Ltd, Fleetwood as MARJORIE. 1.11.1907: Registered at Fleetwood (FD139), George E. J. Moody, Grimsby, manager. 1.1.1914: Tonnage altered to 96.27net under provision of Merchant Shipping Act 1907. 6.1914: Sold to Société Anonyme Pêcheries du Nord, Ostend. 6.1914: Registered at Ostend as MARGUERITE (O154). 1926: Sold to Société Anonyme Chalutiers de la Rochelle, La Rochelle. Registered at La Rochelle as AVOCETTE. 1937: Sold for breaking up. 27/12/2008: Page published. 4 updates since then. 06/05/2017: Removed FMHT watermark from image. This entry was posted in Steam Trawlers, Steamers (Picture) and tagged Fleetwood SFC on December 27, 2008 by Fred Smith. 27.12.1904: Launched by Earle’s Shipbuilding & Engineering Co Ltd, Hull (Yd.No.490) for The Fleetwood Steam Fishing Co Ltd, Fleetwood as LUCY. 1.1905: Completed (George E. J. Moody, Grimsby, manager). 6.2.1905: Registered at Fleetwood (FD24). 21.1.1917: Stopped by U-boat (U45) while fishing 42 miles NW by N of Inishtrahull; crew abandoned in boat. Sunk by gunfire at 9.00 am. in position 55.51N 8.17W. 22.1.1917: Crew landed safely at Castlebay, Barra. 26.1.1917: Fleetwood registry closed “Sunk by enemy submarine”. 26/12/2008: Page published. 3 updates since then. This entry was posted in Lost Vessels, Steam Trawlers, War Losses and tagged Fleetwood SFC, Lost, War Loss on December 26, 2008 by Fred Smith.